Even if it was not one of only two volcanoes in the coterminous United States to erupt in the 20th Century, Lassen Peak would remain one of the two dominant landmarks in northern California. Marking the southern end of the Cascade Range, Lassen Peak is visible from throughout the region, particularly from the Sacramento Valley, which lies west of the mountain. While only a fraction of volume of Mount Shasta, and nearly 4,000 feet shorter, Lassen Peak is still a mountain that demands respect. The peak is the second highest summit in the northern part of California (after Mount Shasta, of course), is the 9th highest summit in the entire Cascade Range (which extends from British Columbia in Canada to the area just south of Lassen Peak) and is one of the 57 ultra-prominence peaks (ranked 51st) in the contiguous United States. Despite these impressive figures, Lassen Peak remains one of the most accessible volcanoes in the Cascades. No technical climbing is required to reach the summit, and the numerous trails in the surrounding region provide a host of opportunities to view the mountain from a variety of perspectives. The two most popular vantage points are from the Manzanita Lake area northwest of the mountain, and from Lake Helen, due south of the summit. While Lassen Peak was a central landmark in the region prior to 1914, the mountains' eruption brought added attention to the mountain. Prior to the mountains' awakening, no volcanoes had erupted in any of the states of that time. A particularly massive eruption occurred in 1915, which prompted the creation of Lassen Volcanic National Park the following year. The mountain and its volcanic legacy are the obvious centerpieces of the park, though numerous other volcanic features such as cinder cones and lava flows are worthy additions to the National Park. The park also boasts excellent wilderness backcountry. Geothermal activity around Lassen Peak provides potent testimony to the violent past that created the volcano. The Sulphur Works and Bumpass Hell are easily accessed from the main road around the base of Lassen Peak. All geothermal features except geysers can be observed here, particularly at Bumpass Hell. The Drakesbad area also features substantial geothermal activity. Lassen Peak actually formed along a side vent of Mt. Tehama that eventually collapsed in on itself, becoming a "plug-dome" volcano. During the winter and spring Lassen is popular ski mountaineering and snowboard destination. Summer to autumn hiking on this peak is straight-forward following a tourist trail which asends the Southeast Ridge to the summit from the 8,500' Lassen Peak trailhead. Due to its location, Lassen Peak may receive more snow than any other part of California, often with 30+ foot snow drifts above 8,000 feet, making it an ideal mountain summit for ski mountaineering, backcountry snowboarding, and general mountaineering. After the road is plowed in late spring it is even possible to hike up the south side in sandals to ski / snowboard down. The Northeast (4,000' descent), Southeast, South, Southwest, and West Faces offer popular ski descent runs. 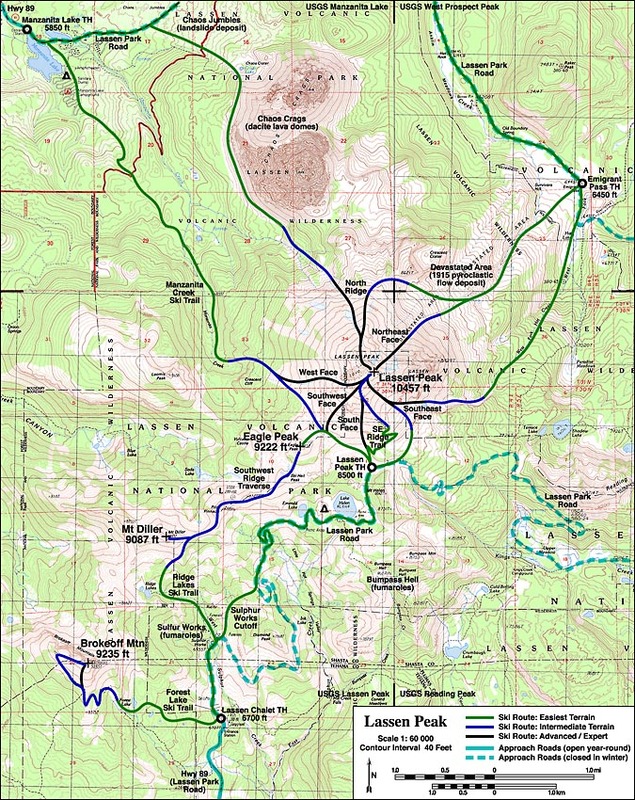 The Lassen Peak Trail is currently undergoing reconstruction work and will be temporarily closed at various times throughout the summer. More information and updates can be found here. Lassen Peak was born out of the ruins of Mount Tehama, a prehistoric volcano. Geologists believe the old mountain rose in excess of 12,000 feet, prior to its final eruption. It is believed that its final eruption decimated much of the mountain, greatly diminishing its height and bulk. Following the eruptive period, substantial glaciation further reduced the mountain to a series of ridges and smaller peaks. Today, all that remains of the original Mount Tehama is Brokeoff Mountain and Mount Diller. They constitute what would have been the southwestern flank of the prehistoric volcano. While the original mountain my have been ruined, the forces beneath the earth that both created and destroyed it are still at work. The abundance of geothermal activity is living testimony to this. More dramatic still, Lassen Peak itself is evidence of the volcanic power still surging beneath the mountain. In the wake of the destruction of Mount Tehama, the forces that obliterated the mountain, volcanism and glaciation remained active. Over time, the lava beneath Mount Tehama began pushing its way through the wreckage of the former mountain, uplifting the earth above it. Ultimately, it broke through the rocky debris left over from Tehama's eruption. Once it reached its current height, glaciers went to work scouring its sides and giving the mountain its present shape. Beginning in 1914, Lassen Peak began a period of eruptive activity. Minor eruptions occurred intermittently for a year. On May 22, 1915 the mountain experienced massive eruption. The ash plume rose over 30,000 feet and spread ash over 200 miles to the east. The area immediately to the east of the volcano was destroyed, striped of its trees and soils and massive rocks were strewn throughout the area. Many of these rocks were too hot to touch for days after the eruption. While the 1915 eruption was the peak of the activity, smaller eruptions continued for six more years, finally ceasing in 1921. It was because of the events during this period that Lassen Volcanic National Park was created. During the summer, the only route to the summit that is permitted is the Lassen Peak Trail, however, during the winter and spring many other routes are open for climbing and skiing / boarding. Year round trailheads to this peak are on the Lassen Loop Road whether you are driving to the Lassen Peak trailhead on the South Side or cross-country skiing from the Manzanita Lake or Mineral entrances to Lassen Volcanic National Park. LASSEN PEAK TRAILHEAD FROM NORTH: To reach this summer trailhead, leave I-5 at Redding heading East on California SR-44. Continue South on to California SR-89 at the junction and drive another 22 miles past the Manzanita Lake park entrance to the trailhead. LASSEN PEAK TRAILHEAD FROM SOUTH: Leave I-5 at Red Bluff heading East on California SR-36 towards Mineral. Turn north at the SR-89 junction and continue 12 miles into the park to reach the trailhead. EMIGRANT PASS / DEVASTATED AREA (6,446'): There is a gate on CA SR-89 at Emigrant Pass that is just south of the Devastated Area parking lot. This is about 10 miles from the northern entrance of the park. When the road is plowed this is a popular trailhead for the North Ridge, Northeast Face, and Southeast Face routes. WINTER VISITS: Most of the Lassen Loop Road is not plowed during the winter, however, the south Mineral entrance is plowed to the Lassen Chalet and visitor center including the relatively large parking lot from where you can ski into the park. To the North, SR-89 is plowed until the Manzanita Lake trailhead from where you can ski in. Lassen Volcanic National Park is part of the US National Parks Service and a park entrance fee is charged. As of June 2008, a 7-Day vehicle entry pass is $10 and an annual pass to just this park is $25. You also have the option of purchasing an American the Beautiful - National Parks and Federal Recreational Lands Annual Pass for $80. Generally, people climb June to October, but ascents are possible year round. The ski season is typically from February to early June. During the winter the most of the Lassen Loop Road isn't plowed which means you'll have a much longer approach. See the Getting There Section above for more information. This often means that people will opt to ski Brokeoff Mountain and other peaks closer to the south Mineral entrance station. If all you're interested in doing is climbing up the trail to the summit, then camping probably isn't required. If you plan on exploring the other great sites within Lassen Volcanic National Park, then opportunities abound! For campsite reservations, please visit www.recreation.gov or call them at 1-877-444-6777. For more information about the campground specifics, please visit the appropriate NPS website. Although summer conditions are often excellent, winter can bring strorms and a lot of snow. Check the following resources for climbing conditions. According to the "official" park map I received on 9-27-06 the summit elevation is 10,457'. I don't offer this so much for correction as I do for additional "fact." As for me personally, I don't really care that much about 4 feet. Your page is very good; thanks for your fine work.